The original stick-on moxa that has many imitations but no superior. Scientifically developed to deliver consistent temperature-controlled heat without burning. 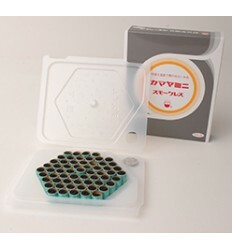 Moxa is held within a cardboard cylinder. Cylinder base has a moisture activated glue for adhesion to the skin. Simply use the handy tool to push the moxa up inside the cylinder, then moisten the base, place over the acupoint and light with an incense stick. Box containing 120 pieces of Smokeless Moxa.